As much as I thought I was doing a kickass job pretending to have a masterful hold on the conversation, she clearly didn't believe me, because she finally wrote down 'Olbas Oil' on the corner of my scrip. Turns out it's basically just Vicks VapoRub in oil form so it's easier to dispense. Who knew? Yesterday I got called for a customer satisfaction survey by my bank. But the whole survey was about Pride of Britain and how much my feelings about my bank had improved based on my knowledge that the bank was sponsoring Pride of Britain. The only problem? I have no idea what Pride of Britain is. The surveyor was pretty devastated at my super non-committal answers and I couldn't really find a way to say 'I have NO IDEA what you're talking about' without sounding like a jerk, so I just kept answering the questions and hoping that my completely blasé responses don't mess up their data too much. Last month I was walking Holtzmann when an older man and his 4-ish year old grandson stopped me with an adorable request: 'may I touch your dog?' While the 4-year-old petted Holtzmann, the grandfather asked me how much she cost. 'Excuse me?' I asked, hoping I had misheard. 'How much does a dog like that cost?' he repeated, making the international sign for money with his thumb and first two fingers. 'Oh, well, I mean, we got her from a friend-of-a-friend, and we've had her so long I don't really remember what we paid for her, it was the cost of her shots and food, you know...' I prattled on because I didn't want to be having the 'how much is your dog worth?' conversation, and eventually he cut me off, laughing heartily. I looked at him blankly, when his grandson finally looked up. Finally I figured out this was a Scoticism (I guess?) for shedding. Luckily it wasn't the first time I've caused a Scotsman to burst into hysterical laughter at my misunderstandings, so I wasn't nearly as embarrassed as I would have been a few years back. (Although by now I guess I really have no excuse). So on the brink of our fifth Christmas in Scotland (how did that happen? 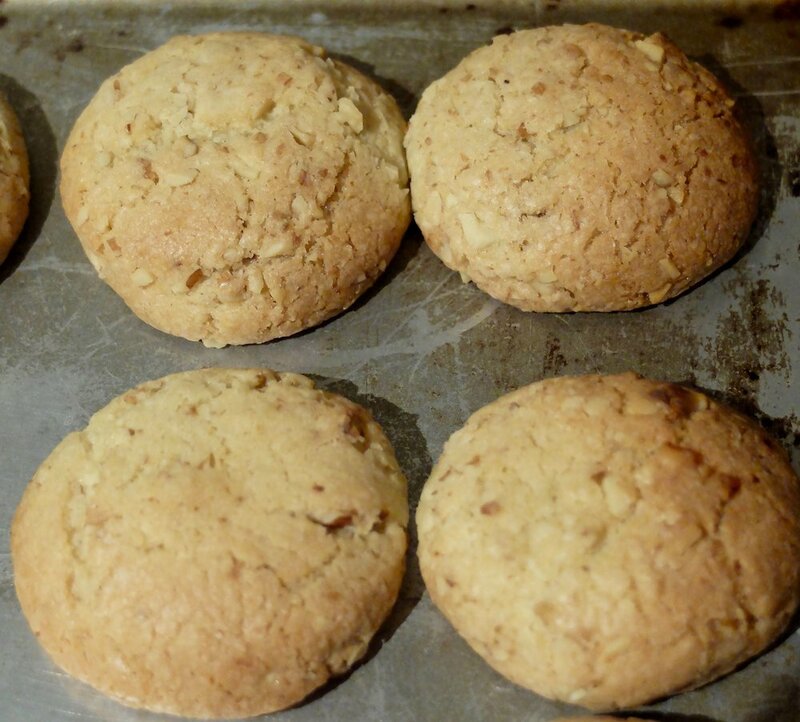 ), here are two more biscuit recipes for you, perfect for this wintry weather we've been having lately. While both recipes are called snowballs, they come from different sources in the Recipe Box, and, since my supermarket has stopped selling pecans less than two weeks before Christmas, the one that calls for them is made with pistachios, giving them a festive green colour. Also, the recipe for the pistachio version doesn't include instructions to roll them in powdered sugar, but, like, why else would they be called Snow Balls? So I rolled them and I regret nothing- without it, they were pretty much just shortbread balls anyway. 2 spoons out of five. The dough for these was so beyond dry I had to add extra moisture to it and mix it like crazy to get it to stick together, and all that extra handling made them tougher than I wanted them to be. But the flavour of the pistachios really came through and they were pretty similar in texture to Italian Wedding Cookies, so if you love those, these are gonna be a treat for you. 4 spoons out of five. They're the perfect balance of chewy and cakey, and the toasty nut flavour really makes it perfect for this time of year. Add all other ingredients except water, beating until mixture resembles coarse meal. Taking a spoonful of the dough, form a walnut-sized ball. If mixture does not stick together, add water a few drops at a time, stirring frequently JUST until dough comes together enough to barely hold together as a ball. Place balls ½-inch apart on cookie sheet and bake 8-10 minutes until light golden. Once balls have cooled completely, roll them in powdered sugar and serve. Sift together flour, baking soda, cream of tartar and salt, then set aside. Add powdered sugar gradually and cream until fluffy. Add egg and vanilla, scraping sides and mixing until incorporated. Add sifted dry ingredients and mix just until it comes together. Add walnuts and mix until uniform texture. Roll dough into balls the size of walnuts. Bake 7-9 minutes until golden at edges. While cookies are baking, prepare a small bowl of powdered sugar. As soon as cookies come out of oven, dip the tops in powdered sugar. Tap off any excess and allow to cool completely on a cooling rack. Once cool, dredge in powdered sugar again.